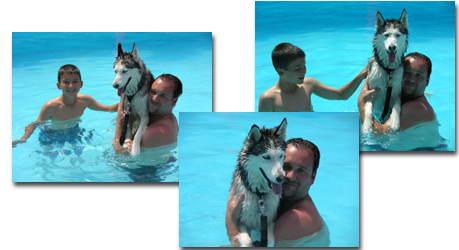 On June 4, 2005 Yukon found his forever home with Steve and Debbie and the infamous Mac 'n Cheese, his feline siblings. His former owner knew that the right home was out there somewhere and she looked to TOTTSHR to help her find it. On the day of his adoption Yukon impressed his new mom and dad with his dashing good looks and his well-mannered personality. He even decided that Mac 'n Cheese were probably less tasty than they sounded. 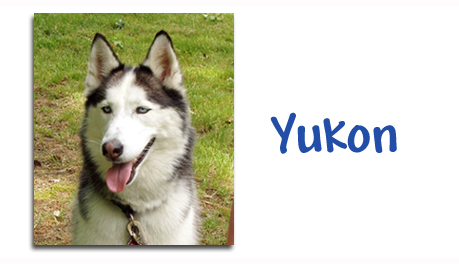 Yukon is currently spending his summer pool side, with new friends and family. Lucky dog! I know it has been a while since I sent an update on Yukon so I am overdue. When last we spoke it was a few weeks after we adopted Yukon and he was experiencing some separation anxiety during the day when we were at work. We needed to do something since he obviously was not happy being separated from the rest of the house and us during that time. The main reason we separated him was the fact that we were not positively sure that he would behave with his feline companions, Mac and Cheese. We decided that we needed to do some trial runs with him and give him some more freedom. So we gated off some areas for the cats to “escape” in the case that he got hungry, and we left the house. We intermittently peeked through the windows to see what was going on. I am pleased to say that he did exceptionally well. He did so well that within a few days we discovered that Yukon and Cheese (our female cat) would sleep together in the kitchen when we left and and most days were still in the same spots when we got back. It was almost like Cheese was his babysitter, she would sit on the chair and sleep and watch him during the day. Yukon has been exceptional with our cats, he knows that they are his companions in the house and has never showed any sign of wanting to hurt them. Occasionally he tries to get them to play but backs off immediately when he sees that they do not want to play with a big dog. 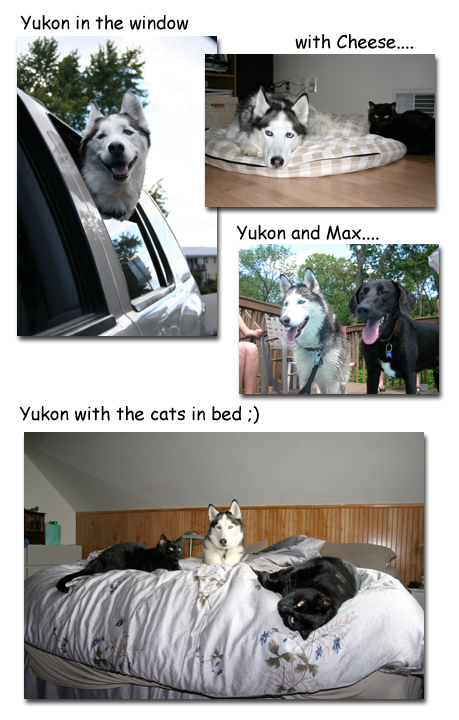 Yukon has adapted to our home very well, he loves the fenced in yard that we installed a few weeks after his arrival and has made it known to us that if the cats get to sleep with us in bed – so will he! Needless to say there is not much room for my wife and I in the bed and it seems like an endless game of Twister until all of the animals find their spot for the night. (We will be getting a larger bed in the very near future.) Yukon is especially funny at night, when he gets tired, and he decides that it is his bedtime, he will run up the stairs and jump into bed, with us or without us usually joining Mac and Cheese. Yukon has bonded very well to my Aunt and Uncle’s Black Lab Max as shown in the attached picture, whenever they are together, the play endlessly until they both are ready to pass out. Yukon constantly thinks all of Max’s toys are better than his and his food and water always tastes better as well.